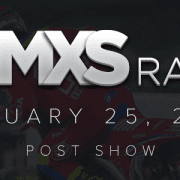 #14 – Justin Hill – Wil Hahn on DMXS Radio! Monster Energy Pro Circuit’s Justin Hill is our brand spanking new 250SX West Region Champion, folks! It’s been quite the roller coaster ride for Justin over the last few years and we wanted to add our love and get his thoughts on this career milestone after a few days of letting it sink in. Wil Hahn has been part of our family for a long time now and our listeners have enjoyed getting to know him off the track, too. Honestly, he’s shared way too much and it’s been awkward at times, but they just can’t get enough of his story. We’ll see what Lil’ Wil is up to and get his thoughts on the racing and more. https://www.dmxsradio.com/wp-content/uploads/2017/04/42717Featured-Image.png 300 800 Brian https://www.dmxsradio.com/wp-content/uploads/2017/01/Admin_logo.png Brian2017-04-30 19:09:342017-09-14 08:38:56#14 - Justin Hill – Wil Hahn on DMXS Radio!